Summer 2001, Sony/Legacy released the FIRST-EVER live greatest hits CD from LOVERBOY's intense touring years of 1982-1986 appropriately titled "LIVE, LOUD & LOOSE." Joining Sony/Legacy's best-selling "Live from the Vaults" series that has unearthed live recordings by Janis Joplin, The Byrds, Cheap Trick, Carole King, Ted Nugent, Santana, and others, LOVERBOY's "LIVE, LOUD & LOOSE" is a collection of live recordings captured on tape from some of their most exciting concerts. Recorded for Westwood One's syndicated radio series at concerts in Pittsburgh, LaCrosse, and their hometown of Vancouver, the CD contains 14 previously unreleased live concert recordings, featuring LOVERBOY's mega hits which include: Working For The Weekend, Lucky Ones, Lady Of The 80's, Take Me To The Top, Jump, This Could Be The Night, Dangerous, Lead A Double Life, When It¹s Over, Queen Of The Broken Hearts, Lovin' Every Minute Of It, Hot Girls In Love, Turn Me Loose and The Kid Is Hot Tonite. In conjunction with the release of "LIVE, LOUD & LOOSE", LOVERBOY will tour the U.S. & Canada in 2002 in support of the new collection. The tour will be dedicated to the memory of their late bassist, Scott Smith, who was declared lost at sea on November 30, 2000. With the CD also dedicated to Smith,"LIVE, LOUD & LOOSE" serves as a special memory for the band that has been together for the last 21 years. Loverboy's inception began in Calgary, Canada, when Mike Reno was introduced to Paul Dean at The Refinery Night Club, which at the time was owned by their manager Lou Blair. Reno happened to be at the club and heard Dean playing his guitar out back in a warehouse. Over the next few weeks, Reno and Dean hung out and jammed on guitar and drums. Doug Johnson, who was in another Canadian recording band, began to hang out with Reno and Dean. It was in one of those jams that Reno, while playing drums, laid down the bass pattern for Turn Me Loose -- LOVERBOY was born. After being rejected by all the major U.S. record companies LOVERBOY signed with Columbia Records Canada. On March the 20th, 1980, LOVERBOY went into the studio with producer Bruce Fairbairn and recorded their self-titled debut album -- LOVERBOY. The summer of 1980 saw the record fly out of the stores setting record sales for a debut album -- over 700,000 records in Canada. Columbia U.S. had no choice but recognize that 700,000 people could not be wrong. The U.S. released the album in November 1980 and by April 1981, it had gone GOLD. LOVERBOY's debut album went on to sell more than 2 million albums in the U.S. and 4 million worldwide. Soon the band found themselves playing on mega tours with Journey, Bob Seger,Cheap Trick, ZZ Top, Kansas and Def Leppard, to name a few; they quickly became MTV darlings, being one of the first bands ever featured on the music channel. Between dates, the band wrote and recorded their second multi-platinum selling album. In 1981, GET LUCKY was released. It featured Working For The Weekend, When It's Over, Take Me To The Top, Only The Lucky Ones, Jump, etc. GET LUCKY, and the band's enormous touring success, led LOVERBOY in 1982, to an unprecedented six Juno Awards, Canada's highest music award. This record still stands today. LOVIN' EVERY MINUTE OF IT, the band's fourth album, hit the airwaves, and landed them as one of the Top Five grossing touring acts, performing in over 100 cities across the U.S. and Canada. Their success earned them the title of becoming the first Canadian group to earn Columbia Records' exclusive Crystal Glove Award, celebrating the sale of over five million albums outside their native country. In 1986 LOVERBOY recorded Heaven In Your Eyes, for the soon to be blockbuster movie - TOP GUN. The single went Top 5 on Billboard's chart. This was followed by the 1987 release of WILDSIDE -- LOVERBOY's last studio album of the 1980's. After nine years of being ruled by LOVERBOY's agenda of recording, touring, television appearances, videos, hoards of interviews Paul, Mike, Matt, Doug and Scott decided to take a rest from the band and each other. The year was 1989. In the late fall of 1992, LOVERBOY re-united to join Bryan Adams, Bon Jovi and other stars to help raise money for cancer-stricken friend and fellow recording artist Brian 'Too Loud' McLeod. Unrehearsed, and three years since their last performance, the band hit the stage running. The music industry-dominated crowd loved what they saw and were reminded of why LOVERBOY was such a great live band. Mike, Matt, Doug, Scott and Paul felt they this was the most fun they had had in years. They wanted to do it again. This time LOVERBOY decided to have some fun. They got into their own cars and drove around Western Canada doing selected dates. They were back doing what they loved -- performing live. In 1993 the band decided to go back into the U.S. with some trepidation -- LOVERBOY did 64 concert dates. There was no reason to be nervous. The fans came back out and brought new ones with them. Sony/Legacy released a new greatest hits album entitled, LOVERBOY - CLASSICS. By now, the band had been touring every year since 1993 doing shows with old friends such as Foreigner, REO Speedwagon, Cheap Trick, Night Ranger, Eddie Money. In 1998 they performed over 95 concerts in the U.S. alone. Old habits die-hard -- still relentlessly touring. A direct result of touring was that in the U.S. in 1998 LOVERBOY - CLASSICS went GOLD. Buoyed by their new GOLD record, LOVERBOY management and Sony/Legacy started to exchange ideas on a live album. Having never released a live record it was decided it was time. Live recordings had to be relocated. They had to be carefully handled because most of the live concert recordings had being lying dormant for over 15 years. Members of the band worked with Al Quaglieri [Sony Producer] to refurbish the recordings. Finally, after two years of work, "LIVE, LOUD & LOOSE" is ready to be released. "LIVE, LOUD & LOOSE" truly captures LOVERBOY's spirit and high energy live performances. Old and new fans will be taken back to the 80's when rock music was uplifting and powerful. 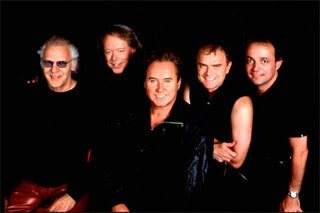 LOVERBOY will spend this summer and fall performing at selected dates throughout the U.S. and Canada. As the late Scott Smith told former MTV founding VJ Nina Blackwood for the liner notes of the CD, "Enough of the long-winded reminisces! Slap this baby in your CD player and crank it up. If it takes you back to a certain show and good memories, then you've made us happy." Noteable Entertainment & Events is a Vancouver based booking agency, party rental, entertainment services and event production company. If you are interested in booking Loverboy please contact us.